Entomology is the study of insects, which are those organisms that have an exoskeleton, 6 legs, 3 body segments, 1 pair of antenna, and 1 pair of compound eyes. The rapidly growing field of forensic entomology is broadly defined as the application of the scientific study of insects and their arthropod relatives to legal matters. Forensic entomologists frequently deal with non-insect arthropods such as spiders, mites, and ticks. Therefore, the basic definition of "forensic entomology" extends beyond "entomology." Within the forensic sciences, forensic entomologists can help to establish a portion of the postmortem interval (which is known as the period of insect activity, or time since colonization), assist in establishing the geographic location of death in cases of body transport, help associate the victim and suspect to each other and to the scene, and help the pathologist identify sites of trauma on the corpse. Additionally, entomologic evidence can be utilized as alternate toxicology samples, and their gut contents can be sources of human DNA viable for forensic testing. Other forensic uses of entomology have been to identify deaths resulting from anaphylactic shock due to insect bites or stings, to resolve traffic accidents resulting from panic due to stinging insects in an automobile, and to be used in consultation in criminal cases involving the misuse of insects that are induced to bite or feed upon the victim. The major area of research and case application of entomology in forensic science is the use of species identification, known growth rates, and insect succession data to determine both the location and approximate time of the victim's death. Due to the recent widespread acceptance of entomology within the forensic sciences, many police agencies, medical examiners, coroners, and federal agencies throughout the United States are requesting assistance from entomologists knowledgeable in the behavior and biology of carrion insects to help answer critical questions pertaining to human death investigations. The following image is that of a hairy maggot blow fly. The Hairy Maggot Blow Fly (Chrysomya rufifacies) is a species which arrives very early in the process of decomposition. In some instances it has been known to arrive within minutes after death. The first documented case involving the use of an insect in a death investigation can be dated to 13th century China. Sung Tz’u (also known as Song C) was a practicing lawyer and death investigator who became a leading criminologist with the publication of his manuscript in 1247 AD entitled 洗冤集錄 (Hsi Yuan Chi Lu, commonly translated to "Washing Away of Wrongs"). This work documents a case in which Sung Tz’u was able to solve a murder that involved a sickle. Unfortunately, the discipline of forensic entomology did not develop rapidly after these well-documented case histories. In fact, the association of insects to decomposing tissues was somewhat of a mystery to European society. 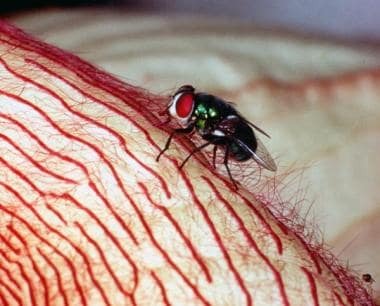 It was not until the mid-1600s when the hypothesis that flies were a "spontaneous generation" of life on corpses was first refuted. Redi proved this assertion of biogenesis (as opposed to abiogenesis or "spontaneous generation") by arranging 6 boxes. The first contained dead snakes; the second, a dead pigeon; the third, veal; the fourth, the flesh of a horse; the fifth, a capon; and the sixth, the heart of a sheep. He placed covers over the first 3 boxes and left the last 3 open; then, he monitored the boxes over several days and noted that the meat left exposed were the only samples hosting maggots, and the meat covered and protected from flies did not contain any parasites at all. Redi duplicated this experiment by burying the meat underground, in sealed containers with dead flies, and even placing the meat in a sealed wire contraption that allowed flies to be attracted to the smell of the meat but still unable to penetrate to the meat. In this final example, Redi observed flies actually laying their eggs on the surrounding wire in an attempt to get their young to nourishment. In all trials, however, unless flies were allowed direct contact with the dead flesh, maggots were never produced, because parent flies did not deposit their larvae. 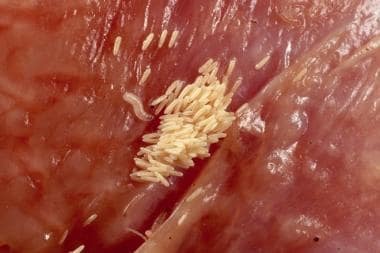 By preventing flies access to the exposed meat, Redi proved that it was the action of eggs hatching that produced the otherwise supposed "spontaneously generated" maggots. Until this experiment, spontaneous generation had been an acceptable explanation for the presence of arthropods around corpses. Insects, particularly maggots, were believed to have been produced from rotten meat under the right conditions. Redi's findings were astounding to the science community, but they would not be applied to the forensic sciences until hundreds of years later in 1855. The first documented forensic application of entomology in a medicolegal setting was in the case of the mummified corpse of an infant found behind a mantelpiece. At that time, criminal investigation was highly subjective and thus, the current inhabitants of the house were immediately cast into blame in the court of public opinion. However, when the infant was autopsied by Bergeret d'Arbois, he found that the child had died several years earlier in 1848. D'Arbois was the first to use insects as a forensic indicator of the time of death. He was able to reach his conclusion due to the evidence of flesh flies (Sarcophaga carnaria) that had originally scavenged the body in 1848. Then, there was evidence on the corpse that in the following year, mites had left eggs. This was enough proof for investigators to track down the inhabitants of the home in 1848, who were later found guilty of the crime. D'Arbois was able to connect the predictive cycle of insects as they decompose a corpse and the significance of the length of their life cycles to predict the age of the deceased infant. Although some of his inferences would not stand in a modern courtroom, his conjectures opened up a realm of possibility for forensic scientists to identify time of death. The first case of forensic entomology being used in the courtroom came in 1850 in France. The remains of a child were found in a chimney during the process of redecorating a home. The current occupants were cleared as suspects from the case due to insect activity. A controversy to this case is that the medical examiner determined that the development of the adult flies took 1 year, due to poor understanding of the insect biology. These determinations had been based largely on casual observations and not through scientific research. Through the proper analysis of entomologic evidence, the modern forensic entomologist can assist police, medical examiners, coroners, and medicolegal death investigators in the determination of a portion of the postmortem interval (PMI). Most frequently, the entomologic-based time frame is the minimum portion of the postmortem interval, and it is determined by a minimum time since insect colonization. This time period is calculated by using known developmental rates for insect species that are attracted to decomposing tissues, both human and animal. Therefore, the minimum postmortem time interval can be estimated through the knowledge of insect activity and development throughout the decomposition process. The most useful and important group of insects associated with the early decompositional stages of a human corpse are the blow flies (Diptera: Calliphoridae). These flies are usually the first insects to appear on carrion and are the most active and abundant insects found throughout the year in many geographic locations. Due to their early arrival, large numbers, and voracious appetite, the larvae of the Calliphoridae are responsible for consuming most of the soft tissues in just a few days (see the image below). Because many species of Calliphoridae have been well studied due to their potential for negative economic impact in the livestock and agricultural industries, the wealth of data on their life histories can provide the forensic entomologist an accurate estimation of a portion of the postmortem interval. Freshly deposited blow fly eggs and newly hatched first instar larvae. The eggs are the first stage in the life cycle of a blow fly. Eggs such as these can hatch in 8-14 hours and are often overlook by forensic investigators due to there small size of 1-2mm in length. The larvae begin to feed immediately upon hatching, but are not able to penetrate unbroken human skin. Entomology is not limited to identifying a portion of the postmortem interval. The entomologist's knowledge of the geographic distribution of various insect species can help investigators determine the location of death and possibly associate the suspect with a victim. This is possible, because in some instances insect species are restricted to a particular geographic location. For example, if the insect species found in association with a corpse and the suspect's car are only found in a particular area, the insects can serve to associate the corpse, car, and suspect. Entomologic evidence may also be useful in cases concerning the abuse and neglect of children or the elderly. In such cases, time inferences can be established by analysis of the entomologic evidence as it pertains to certain significant events in the case. There are many methods that a forensic entomologist can use to determine the entomologic-based portion of the postmortem interval,  which is also known as the time since colonization or period of insect activity. These 2 methods are very common but quite distinct from each another. The most general of these methods uses knowledge of insect succession by establishing a portion of the postmortem interval from the simple presence (or absence) of insects on human remains. This method is most accurate for cases in which the postmortem interval is several weeks to months. One advantage to this methodology is the ability to utilize seasonality, which can estimate the time since colonization over several seasons or years (see the image below). 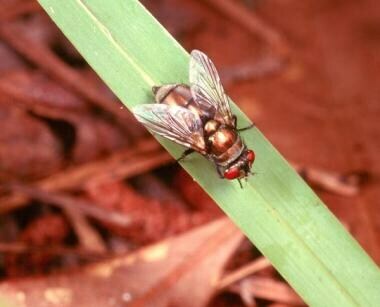 The Bronze Bottle Blow Fly (Phaenicia cuprina) is most predominate in the spring and fall months throughout most of the United States. This species can arrive hours or days after death, and usually does not arrive after the second week. A disadvantage of the insect succession method is that the data can take years to generate, and it requires the application to be limited to cases from geographic areas similar those in which the original succession research was conducted. If the geographic habitats differ, research would have to be conducted within the same geographic habitat in which the case originated to determine the extent of similarities and differences in the pattern of insect succession. In fact, succession data could be even more limited in its application. The applicability of using succession data as an estimation of the time since colonization can be very limited due to the time-consuming task of data collection for specific environments. A more widely used approach to time since colonization determination is to utilize the rate of insect development in the decomposing tissues of the body. A principle advancement in the field of forensic entomology is the ability to apply the knowledge of the insect temperature-dependent development to the time since colonization estimation. Although many scientists still do not fully comprehend the usefulness of this method, it is not a new concept. The basic premise of temperature-dependent rates of development is that the insects develop faster as temperatures increase above their "thermal minimum" or "developmental minimum." [5, 10, 11, 12, 13, 14, 15, 16, 17] This temperature response can be illustrated by an "S-shaped" growth curve. [18, 19] Countless marine and terrestrial organisms exhibit this type of development, and it is commonly used as a predicative indicator by natural scientists throughout the world. With a variety of analytical techniques at their disposal, the modern forensic entomologist is well prepared to assist those involved in the death investigation process when entomologic evidence is recovered. However, the death investigator is generally advised to contact a forensic entomologist before their services are actually needed. An established line of communication, and a small amount of previous training in collection and preservation techniques, can greatly improve the usefulness of arthropod evidence in human death investigations. It is important for the death investigator to note that the collection of entomologic evidence at the death scene will often result in an unavoidable disturbance portion of the remains and/or associated objects. Therefore, a detailed plan should be created at the scene for the collection of entomologic evidence in sequence with other valuable physical evidence. This plan should be approved by law enforcement (due to the possible disturbance of physical evidence) and by the medical examiner or coroner (due to the possible disturbance to the body). Owing to unique circumstances and specific environmental requirements, the collection protocol detailed below may require modification. Collection of the basic information required for entomologic evidence can be recorded on the "Forensic Entomology Scene Form." Visual observations at the death scene. Notes should be taken as to scene habitat type, weather conditions, location, and orientation of the body. Collection of meteorologic data at the death scene. This should include ambient temperature, humidity, and sun exposure. Collection of specimens from the body. This should include 2 samples from each location of colonization: a sample of insect specimens preserved at the death scene and a sample of live specimens for laboratory rearing. Collection of specimens from the surrounding environment, 20-30 feet from the body. This should also include 2 samples from each area of insect activity: insect specimens preserved at the death scene and live specimens for laboratory rearing. Collection of specimens from the area directly underneath the body once it has been removed from the scene. This should include at least 3 soil samples, taken from under the head, chest, and pelvic region and kept in separate zipper top or Whirl-Pak bags. Collection of specimens during autopsy at the medical examiner or coroner's office. A detailed inspection of the clothing and objects in immediate contact with the body for additional insect species not yet recovered from the death scene should occur. This step should include insect specimens preserved at the time of examination and live specimens for laboratory rearing. The 6 stages of entomologic evidence collection will be addressed in more detail in the following sections. Begin the scene analysis by completing the "Forensic Entomology Scene Form." Record the exact location of the site, being as specific as possible (eg, 55' SE of I-95, 2 miles south of exit 96, in Miami, Dade County, Fla). If possible, record the site's exact latitude and longitude, using a Global Positioning Instrument (GPS). Before collection begins, prepare all of the collecting equipment so the process can be expedited. (Ideally, the collection equipment should be procured and on hand well in advance of the investigator's response to the scene). To make the maximum use of time, 2 people should perform the entomologic collections: 1 for collecting (the collector), 1 to remain clean (the recorder) for preparing labels, readying collection vials, etc. Make a written record of the variety of insect species present upon arrival at the scene. Supplement the descriptions with photographs of the insect activity. If possible, take macro photographs (close-up) of the individual insects present. If the investigator is unfamiliar with forensic entomology, simply describe each different kind of insect observed (eg, "large, black adult beetles with small orange spots"; "long, thin adult beetles that are black and yellow that appear fuzzy"; "adult flies of numerous colors including blue, green, bronze, and black and white with large red eyes"; "fly larvae (maggots) that are fuzzy/hairy"; "maggots that are long and mostly white"; "small maggots that appear to hop or jump"; "beetle larvae (grubs) thatare white and appear similar to maggots"; "grubs that are long, thin, and hairy"; "large, black grubs"). NOTE: In many instances, grubs will be difficult to distinguish from maggots. However, grubs will always have 3 pairs of legs. Maggots do not have legs. Theseshouldnever be placed together in the same containers. Make written notes, and photograph the locations of insect infestations on the body. This may be helpful in locating potential areas of trauma. Note the various insect life stages present (ie, eggs, larvae, pupae, adults) and their location on the body (see the image below). Note and sketch the position of the body relative to compass or magnetic "north," as well as to its position relative to any doors, windows, sun, or shade. Note the presence of any insect activity in the immediate vicinity of the body. Look for wandering pupae that have formed under or in nearby objects. Check for the presence of dead adult insects along windowsills in indoor locations. Make detailed notes as to any observable trauma, burning, dismemberment, and wrapping. Such situations may alter insect colonization patterns and are important information for the forensic entomologist. Photograph the scene as approached by the investigator (from far to near), including the scene environment (eg, the surrounding vegetation or lack thereof). Also include photographs of any doors and windows of structures. Exterior photographs of the overall structure should also be made. Take numerous photographs of the colonized body in reference to its surroundings, making sure to include close-ups of the head and photographs representative of the state of decomposition. Include macro (close-up) or micro photographs of the insects that have colonized the body as thoroughly and closely as possible. Be sure to photograph each different kind of insect and maggot masses that are seen. Include a photographic scale in the photographs. The color changes of the pupal stage as it ages and progresses toward adult emergence. It is important for the investigator to recognize and document the presence of the pupal stage. This is the intermediate stage between the larva and adult, and the photographic documentation of the pupal color and enhance the estimation of the period of insect activity, or time since colonization. Important: Log all photographs in a photo log as descriptively as possible. Record the body's surface temperature (taken from the upper surface of the body). Record the ground-body interface temperature (taken by placing the bulb of the thermometer between the body and the ground surface). Maggot mass temperatures are recorded by simply inserting the thermometer into the center of the maggot mass. Soil temperatures should be taken as soon as the body is removed. These should be taken from directly under where the body was located and at a remote point 3-5 feet from the body. NOTE: The thermometer should always be kept in shade, and all temperatures should be taken while it is shaded. Solar radiation will increase the temperature reading and make the collected data useless. Estimate the duration of exposure to sun or shade the body would have received. This estimation can be broken down to show the total number of hours in direct sunlight, partial sunlight, and total shade for the daylight hours. Photographs can be taken to illustrate any overhead or surrounding vegetation or structures. Photographs (which include a "north" marker) of the remains shown in relation to its surroundings should also be included in the report. Relative humidity should also be recorded, if possible. These readings can be made from standard dial-faced hygrometers widely available in stores or from a sling (or battery-powered) psychrometer available from various scientific supply houses. After the investigator returns from the scene, official weather data should be collected. The data obtained should span the time period in question. Typically, the data can be easily obtained by contacting the nearest National Weather Service office. Once the station is contacted, maximum and minimum daily temperatures, humidity, and precipitation measurements should be requested. If hourly temperature, humidity, and precipitation data are available, they should also be collected and entered into the report. Depending on the case, additional data such as cloud cover, wind speed, river stages, tides, and soil moisture may be requested by the forensic entomologist. Temperature recordings should also be recorded at the death scene for 3-5 days after the body recovery. Generally, 4 temperature recordings are made, spaced throughout a 24-hour period. However, if this is not possible, recordings should be made during the time of expected temperature minimums and maximums. These temperature readings will be necessary to correlate the National Weather Service data with the temperature data collected during scene processing. Such correlation can be crucial evidence in later courtroom testimony. Ambient temperature (taken away from the body) at approximately 4 ft in height. Air temperature above the body at approximately 1.5 ft. Temperature of the upper body surface. Temperature of the body-ground interface. Temperature of the maggot mass. Soil surface temperature away from the body. Soil temperature at the location of item 6, but at a depth of approximately 1.5 inches. NOTE: Never mix flies and beetles! With aerial netting of adult flies, the specimens can be placed into killing jars and then into another dry container once they are dead. Adult insects (those with hardened exoskeletons) may also be placed directly into a solution of 80% ethyl alcohol. NOTE: It is not necessary to keep the adult insects alive during shipment to the forensic entomologist. Collect a representative sample of adult beetles present with gloved fingers or forceps and preserve as with the flies. NOTE: It is not necessary to keep the adult insects alive during shipment to the forensic entomologist. Collect insect larvae (eg, fly larvae, beetle larvae, fly pupae), as discussed below. Collect a representative sample (approximately 50-60 of each species) of maggots from the body. Because flies have a tendency to lay their eggs in cracks and crevices, maggot masses will usually be found in the orifices of the body and in areas of trauma. The head is colonized first (except in cases with trauma, in which case the areas of trauma are usually colonized at the same time as the head). Always be sure to collect maggots from the head region, as these are usually the oldest and largest maggots. Different species should be packed separately and placed on a rearing medium (ie, beef liver). Containers should be rigid in order to avoid crushing during transport and should allow for air circulation. Each container should be properly labeled with the case number, the date, the location of the site, the location of the body from which the specimens were collected, and the time of day. NOTE: When maggots have been collected from a mass, this should be indicated on the label. In addition, the temperature of the middle of the maggot mass should be recorded (before collection from the mass). A few representative maggots (approximately 50-60 of each species) from each area of collection should be dropped into an air tight vial of alcohol. Again, maggot species should not be mixed. Maggot species should not be mixed. The general rule for recognizing multiple maggot species is, "If it looks different, it probably is different!" For best results, maggots should be packed with a food source to ensure survival. Pieces of beef liver have been found to work well. All soft-bodied insects should be "fixed" in KAA (or KAAD) solution before being placed in a preservative solution such as 80% ethyl alcohol. For example, this chemical mixture is used to kill and "fix" the protein in insect larvae specimens. Collect a representative sample (approximately 10-20 of each species) of grubs from the body. Different species should be packed separately. Also, insects from different areas of the body should be packed separately. Containers should be rigid in order to avoid crushing during transport and should allow for air circulation. Each container should be properly labeled with the case number, the date, the location of the site, the location of the body from which the specimens were collected, and the time of day. Important: Never mix maggots and grubs! Grubs will eat maggots, hence destroying some of the insect evidence. Collect a representative sample (approximately 50-60) of fly pupae from on and around the body. These are small, rigid brown casings in which maggots metamorphose into young adult flies, as shown in the image below. The pupae look similar to roach egg casings and are integral in aiding in the determination of postmortem interval. Because maggots tend to migrate away from a body when they are ready to pupate, certain areas should be searched for fly puparia. In outdoor settings, maggots will tend to bury themselves in the first inch or so of soft topsoil or will migrate under rocks and limbs. 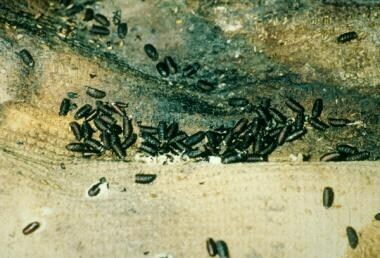 Indoors, maggots will often migrate under baseboards, rugs, and mats. Pupae and pupal casings may be found away from the body as well as on the body and in the clothing and items surrounding the remains. This life stage is later in succession than the larval stages and can be used to provide better estimations on the maximum range of the time of colonization estimation provided by the forensic entomologist. For indoor locations, an inspection of migrating larvae should always be performed. This inspection should consist of checking under carpets, rugs, or baseboards for larvae that have left the body. It is important to note that these insects will not remain in their larval form for very long before they become immobile pupae. In flies, this stage appears like roach eggs or rat droppings. If this stage is found, a representative sample should be preserved by placing it directly into alcohol. A representative sample should also be kept alive for shipment to a forensic entomologist. This stage requires no food, so the living pupae may be placed directly into a dry container and sent to a forensic entomologist. For outdoor environments, the larvae will migrate away from the body and typically burrow themselves into the first inch of topsoil. They will crawl until they find a suitable location consisting of soft, loose soil, or they will crawl under rocks or fallen limbs for protection and pupation. A thorough inspection of the area under debris near the body should be conducted, and the topsoil in the immediate vicinity should be sifted for the presence of migrating larvae and fully formed pupae. Preservation methods can be utilized such as those for indoor environments. Once the body has been removed from the scene, soil samples should be collected. This can be accomplished through the use of a hand trowel or spade. A core sample (about 3" wide and 6" deep) should be collected from the ground directly beneath the major body areas (1 each from the head, torso, and upper legs). These samples should be properly labeled and placed into a cardboard container. Such samples will contain insect specimens that burrowed into the ground for protection (a result of the activity at the scene) and will also contain insect species that inhabit the soil beneath the body instead of the body itself. These species are not usually recovered unless soil samples are taken. NOTE: Soil samples intended for biochemical analysis should be immediately frozen. Another insect collection should be made immediately before (and during) the autopsy. At this time, insect species may be present that were hidden at the scene or were feeding deeply within the body and thus not previously recovered. In addition, these insects will be chilled and moving slowly, aiding in collection. The autopsy also provides the opportunity to closely inspect items in direct association with the body for additional entomologic evidence. The clothing of the victim should be thoroughly inspected for fly or beetle larvae that pupated within the clothing. These will be a different species than those recovered away from the body and are therefore essential to recover. Such species have a tendency to pupate between the inner lining of the clothing and the skin. Collars, cuffs, and waistbands are common pupation sites. Pockets should also be inspected for larvae and pupae. Insect evidence should be shipped to a forensic entomologist as quickly after collection as possible. Insect evidence should always be packed in rigid containers (no plastic bags, please) in order to avoid crushing during shipment. These containers should contain the insects on their food source that are wrapped aluminum foil. Vermiculite, soil, or similar lightweight and absorptive material should be in the bottom of the shipping container, and the foil containing the insects and their food source should be placed on top of this substrate. This will allow for the natural burrowing behavior that larvae exhibit during migration, and it will also serve to absorb excess fluids that may leak during shipment. Include scene notes, the completed death scene form, weather information, and all photographs in the shipment. These documents may be shipped under separate cover at a later date in order to expedite the shipment of the insect specimens to a forensic entomologist. However, it is always a good practice to include one's business card with basic contact information and a case summary within the insect shipment. Do not rely on the shipping label to provide this essential information. Complete "Forensic Entomology Scene Form." Record the exact location of the site. Make notes as to insect activity upon the investigator’s arrival. Note the locations of insect activity on body. Note the life stages present. Note and sketch the position of the body relative to the scene. Note the presence of insect activity in the immediate vicinity. Make detailed notes as to observable trauma. Photograph the scene and surroundings. Take macro (micro) photographs of insects on the body. Record the meteorologic data (See Entomologic Evidence Documentation - Detailed) and the temperature of the maggot mass. Record the ambient temperature (taken away from the body). Record the air temperature at the level of the top of the body. Record the temperature at the body/substrate interface (taken under the body). Record the temperature of the soil surface away from the body and at a depth of 1.5 inches. Collect insects from the body at the scene. Collect specimens from the surrounding scene. Collect specimens from under the body. Collect additional specimens during the autopsy. Ship the entomologic evidence to a forensic entomologist within 24-48 hours. It is clear to most scientists that forensic entomologists do not determine the exact postmortem interval. Instead, they determine the age of the insect larvae and use the behavior of the adult insects and growth and development of the insect larvae to calculate a time interval in which death could have occurred. Therefore, entomologists do not directly estimate the postmortem interval but instead can reliably predict the period of insect activity (PIA) or, more accurately, the range in time for which colonization could have occurred. Entomologists must always work within a reasonable time range for the age estimations of insects. This is because entomologists deal with organisms in natural systems, and therefore accounting for the biologic variation that occurs in these systems, exact estimations that pinpoint the time of death, may never be possible. With continued research in the field of forensic entomology, scientists can develop a better understanding of such variation and can allow for better predictions of the period of insect activity and, potentially, the amount of time that can elapse from death of the organism to insect colonization. In the end, such an understanding of this variation could lead forensic entomologists closer to providing estimates of the true postmortem interval. By understanding the variation and potential error rate associated with the estimates provided by forensic entomologists, scientists move closer to providing law enforcement investigators, medical examiners, and coroners with the information they seek in a clear and concise manner. Furthermore, those involved can more closely adhere to the recommendations and requirements set forth by the Daubert and Frye Standards which govern the courtrooms. Greenberg B, Kunich JC. Entomology and the Law. Cambridge, UK: Cambridge University Press; 2002. 332. Turner B. Forensic entomology: a template for forensic acarology?. Exp Appl Acarol. 2009. 49:15-20. [Medline]. Redi, F. Bigelow, M. [Esperienze Intorno alla Generazione degl'Insetti (1688)] [Experiments on the Generation of Insects, transl M Bigelow (1909)]. Chicago, Ill: Open Court Publishing Company; 1996. Amendt J, Campobasso CP, Gaudry E, Reiter C, LeBlanc HN, Hall MJ. Best practice in forensic entomology--standards and guidelines. Int J Legal Med. 2007. 121(2):90-104. Wells JD, LaMotte LR. Estimating the postmortem interval. Byrd JH, Castner JL, eds. Forensic Entomology: The Utility of Insects in Legal Investigations. Boca Raton, Fla: CRC Press; 2001. 263-85. Hall RD. Status and perceptions of forensic entomology. Byrd JH, Castner JL, eds. Forensic Entomology: The Utility of Arthropods in Legal Investigation. Boca Raton, Fla: CRC Press; 2001. 1-15. Arnold CY. The determination and significance of the base temperature in a linear heat unit system. Proc Am Soc Hortic Sci. 1959. 74:430-45. Sharpe PJ, DeMichele DW. Reaction kinetics of poikilotherm development. J Theor Biol. 1977. 64(4):649-70. [Medline]. Byrd JH, Butler JF. Effects of temperature on Cochliomyia macellaria (Diptera:Calliphoridae) development. J Med Entomol. 1996 Nov. 33(6):901-5. [Medline]. Byrd JH, Butler JF. Effects of temperature on Chrysomya rufifacies (Diptera:Calliphoridae) development. J Med Entomol. 1997 May. 34(3):353-8. [Medline]. Byrd JH, Butler JF. Effects of temperature on Sarcophaga haemorrhoidalis (Diptera: Sarcophagidae) development. J Med Entomol. 1998 Sep. 35(5):694-8. [Medline]. Catts EP, Goff ML. Forensic entomology in criminal investigations. Annu Rev Entomol. 1992. 37:253-72. [Medline]. Higley LG, Haskell NH. Insect development and forensic entomology. Byrd JH, Castner JL, eds. Forensic Entomology: The Utility of Arthropods in Legal Investigations. Boca Raton, Fla: CRC Press; 2001. 418. Higley LG, Peterson RKD. Initiating sampling programs. Pedigo LP, Buntin GD, eds. Handbook of Sampling Methods for Arthropod Pests in Agriculture. Boca Raton, Fla: CRC Press; 1994. Higley LG, Pedigo LP, Ostlie KR. DEGDAY: a program for calculating degree-days, and assumptions behind the degree-day approach. Environ Entomol. 1986. 999-1016. Wagner TL, Wu HI, Sharpe PJH, Schoolfield RM, Coulson RN. Modeling insect development rates: a literature review and application of a biophysical model. Ann Entomol Soc Am. 1984. 77:208-25. Andrewartha HG, Birch, LC. The history of insect ecology. Smith RF, Mittler TE, Smith CN, eds. The History of Entomology. Palo Alto, Calif: Annual Reviews Inc; 1973. 229-66. Davidson J. On the relationship between temperature and rate of development of insects at constant temperature. J Anim Ecol. 1944. 13:26-38. Wells JD, Sperling FA. DNA-based identification of forensically important Chrysomyinae (Diptera: Calliphoridae). Forensic Sci Int. 2001. 120:110-5. Schoenly K. A statistical analysis of successional patterns in carrion-arthropod assemblages: implications for forensic entomology and determination of the postmortem interval. J Forensic Sci. 1992 Nov. 37(6):1489-513. [Medline]. Schoenly KM, Goff ML, Early M. A BASIC algorithm for calculating the postmortem interval from arthropod successional data. J Forensic Sci. 1992. 37:808-23. Schoenly K, Goff LM, Wells JD, Lord WD. Quantifying statistical uncertainty in entomology-based estimates of the postmortem interval in medicolegal investigations: a simulation study. Am Entomol. 1996. 42:106-12. Byrd JH, Allen JC. The development of the black blow fly, Phormia regina (Meigen). Forensic Sci Int. 2001. 120:79-88. Growth and development rates of Chrysomy rufifacies (The Hairy Maggot Blow Fly) under varying temperature regimes.